These clutches are used wherever different sections of a machine needs to be first disengaged from the drive train then re-engaged while maintaining the same phase or angular relationship which existed proir to disengagement. They are often used in a line-shaft, between printing units on an offset printing press, and to disconnect certain units on a finishing line. 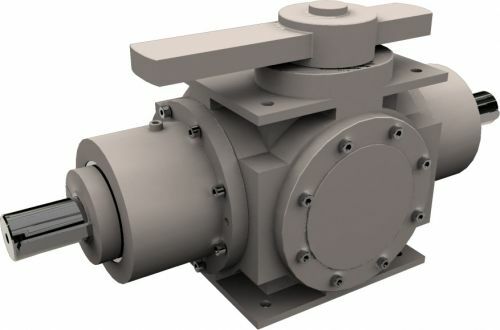 The unit consists of two jaw assemblies mounted on seperate shafts,each supported by two bearings, and enclosed in rugged cast iron housings. This type of construction insures fail-safe disengagement (it will not lock up if failure occurs in disengaged mode). The single position engagement is achieved by providing two teeth with slightly different dimensions. Additionally, the unit offers minimum backlash & maximum torsional rigidity by using high strength,case hardened and ground,chrome molybdenum alloy steel for the jaws and slide-dog shifting elements.The clutch is actuated remotely by a pneumatic cylinder and limit switches, which is provided with the unit, or manually by shifting lever. Ball bearings and viton seals are used to accept higher speed and temperatures. * Higher speeds are possible, please consult your local supplier.